Breath of Fire III[a] is a role-playing video game developed and published by Capcom originally for the PlayStation console as part of the Breath of Fire series. Initially released in Japan on September 11, 1997, the game was later released in North America and Europe in 1998. It is the first game in the franchise to feature three-dimensional graphics and voice acting. The title was developed by director Makoto Ikehara and features a unique jazz-inspired soundtrack by company composers Yoshino Aoki and Akari Kaida. On August 25, 2005, the game was ported and released for the PlayStation Portable handheld system in Japan, and was also released in Europe on February 3, 2006. The story takes place in a fantasy world where humans live alongside anthropomorphic creatures, and centers the story on Ryu, the last of The Brood (a race of people who can transform into powerful dragons), as he searches the world to uncover the mystery of his people and reunite with his surrogate family. Ryu's journey takes him into adulthood where he is joined by a number of other characters who aid him in his quest. Breath of Fire III doesn't feature a major villain in its story, only having minor ones for some of the game's segments. The game received mostly positive reviews upon release, and would go on to sell approximately 425,000 copies in Japan. Breath of Fire III was the first game in the series to feature 3D environments. Breath of Fire III is a traditional console role-playing game that requires the player to accomplish story-based objectives while battling enemy creatures in a number of fantasy environments. Presented from an overhead isometric viewpoint, the player may rotate the game's camera in any direction around the central character, as well as tilt it up or down to see over or under impeding objects. When traveling through the game's environment, each character can perform a unique special ability that allows the player to solve puzzles or destroy objects, as well as gain access to otherwise hidden areas. As the first PlayStation Breath of Fire title, the game uses three-dimensional graphics for scenery, buildings, and other objects, while still retaining two-dimensional sprites for characters. The game introduces a number of new features to the series, including the Master System, which allows any of the game's playable characters to apprentice under specific non-player characters known as masters, which allows them to learn new skills and influence their statistics. An additional feature, the Fairy Village, gives the player the ability to influence the growth of a small town of faeries, which in turn gives them access to special items or in-game features such as mini-games and a sound test. While journeying on the world map, players may set up camp, which can replenish a character's health by resting, as well as allowing them to speak directly to any member of their party. Other series mainstays such as fishing return with a new, expanded interface and point allocation system that keeps track of what fish a player has caught and their size. Battles in Breath of Fire III occur randomly when a player travels through hostile areas or dungeons during the course of the story. Using a turn-based strategy approach, the game allows a player to input commands at the start of each combat round, which are then carried out in accordance with each character's "agility" rating. A player may choose to attack, defend, cast magic spells, use items, change equipment, or flee from battle entirely. A feature, that requires special mention, is the ability to combine chrysms of various attributes in order to transform into different dragon forms (an ability exclusive to Ryu). While previous Breath of Fire titles allowed groups of four characters to participate in combat, Breath of Fire III restricts the party limit to only three, yet offers a new "formation" system that allows for characters to be arranged in certain patterns for tactical benefits. Battles are won when all enemies are defeated, yielding experience points that go towards gaining characters' levels, which in turn leads to higher statistics and new skills. The main characters in Breath of Fire III are Ryu (voiced by Tomoko Takai as a child and Kappei Yamaguchi as an adult) and his companions, a group of adventurers with their own distinct personalities and skills that help move the story forward. Ryu's story is presented in two parts, which involve him as both a child and adult, and his struggles to find his place in the world, as well as his lost friends. As a member of the ancient Brood race, he is a human with the ability to transform into powerful dragons, a power he doesn't fully understand at the beginning of the game, but begins to piece together as time goes on. He is accompanied on his quest by several other playable characters, including Nina (voiced by Kyoko Hikami), a winged princess from the Kingdom of Wyndia and powerful magician; Rei (voiced by Syusuke Sada), member of the cat-like Woren tribe and skilled thief; Teepo (voiced by Yoko Matsui), an orphaned rogue and longtime friend of Rei's with no memory of his past; Momo (voiced by Kaori Saito), daughter of a famous engineer and inventor who wields a SniperCannon ; Garr (Garland in the Japanese version, voiced by Yukihiro Fujimoto), an experienced warrior and member of a group known as the Guardians who serve the goddess Myria; and Peco (Pecoros in the Japanese version, voiced by Ai Kamimura), a plant-like creature who resembles an onion with limited speech and a connection with nature. The cast is rounded out by several supporting characters including Balio and Sunder, brothers and horse-men who act as mercenaries to a powerful crime lord and frequent adversaries of Ryu. Their boss, Mikba, is the head of a criminal organization with the ability to transform into a demon. Deis [b] returns as a powerful sorceress who knows the secrets of the past. Myria, an ancient Goddess of Destruction, serves as the central antagonist once more, though her motives have changed, and she is instead set on preserving the lives of humanity, whom she protects with an over-zealous matron complex, by ordering the death of the dragons centuries ago. Most of the master NPCs are removed from the plot, but Deis serves as one later on in the game. Other masters in the game include the strong giant woodsman Bunyan whom Ryu, Teepo and Rei run afoul of shortly after the game begins, and Mygas, a traveling wizard who is camped outside of McNeil village who has run out of money. The party will also meet the self-doubting master of non-lethal combat, Durandal, who is turn provides the party with the skills to impress Hondara, the benevolent Urkan priest who despises violence. Fahl, the tipsy barkeep from Genmel and friend of Balio and Sunder will become one after those villains are defeated and if they have fought 30 battles without resting. A strange fishman named Giotto teaches skills once the party reaches a high-enough fishing level. Once Ryu and his team fix Rhapala's lighthouse situation and meet the fairies, the errant fairy Meryleep will turn up at a secluded pond asking for her flower jewel which was stolen by a crow. The party can also use Peco to communicate with Yggdrasil trees, which serves as yet another master. Near the end of the game, the dragon spirit Ladon will offer to communicate with Ryu in a similar fashion. Shortly afterward, they steal from the town's corrupt mayor and re-distribute the money to the village. The mayor, however, is secretly a member of a large crime syndicate. The mayor contacts two hitmen, the horse brothers Balio and Sunder, to seek revenge, who proceed to burn down the trio's home and violently attack, beat them easily and leave them for dead. Awakening a short while later, Ryu finds himself in the care of a woodsman named Bunyan who had found no trace of his friends. Believing them to be alive, Ryu travels to the city of Windia where he meets Nina, child daughter of the King, who helps him escape Balio and Sunder, who are now on his trail. Ryu and Nina eventually come across a large tower and meet Momo, an inventor and engineer who is researching the properties of chrysm when the two of them arrive. Together with her diminutive robotic assistant Honey, the three escape the tower by rocket when a group of bounty hunters arrive looking for them. Momo leads them to a nearby chrysm research facility conducting experiments on plants when they are approached by the institute's chairman and colleague of Momo's father, Dr. Palat, who tells them that there is a mutant creature causing trouble at the dump area where their biological waste is stored. After defeating the mutant plant creature, it gives up its offspring, whom Nina names Peco, to be cared for in its absence. As the four continue their journey east, they are captured by Balio and Sunder in a double-cross and taken to a nearby colosseum. It is there that the team meets Garr, a seasoned warrior who aids them in defeating the horse brothers for good. Garr agrees to help the group in finding Ryu's friends on the condition that he also accompany him to a sacred temple far to the east. After crossing a large bridge and traveling straight through a volcano, the group arrives at the temple, where Garr and Ryu journey inward alone. It is there that Garr reveals the true fate of the Brood, having been slaughtered by him and his fellow guardians by the hundreds at the behest of Myria, an ancient goddess who promised an age of peace in return for their services. With Ryu as the last living dragon, Garr attempts to slay him, but Ryu beats him and escapes. Having failed to defeat a child of the Brood, Garr realized that the Brood didn't really fight back against the guardians and could have easily defeated them. The story then cuts to several years later, where reports of a rampaging dragon have led Garr to the same mines where Ryu was originally found, and finds an adult Ryu within its depths. Convincing Ryu that he will not harm him, Garr instead asks forgiveness for his actions against his people centuries ago and asks that Ryu help him discover the truth behind Myria's genocide of the Brood. The two re-group with Nina, now a young adult and find Rei alive, now battling the leader of the crime organization responsible for the attack on his friends. Once they have him join their group, they learn that he also has not seen Teepo since the incident. While checking on some suspicious activity at the plant institute per Nina's orders, the team finds Momo, who has been performing experiments at the plant institute with Peco, who himself has been frequently visiting the great tree Yggdrasil, overseer of the world's forests. They continue their journey once they receive information about Myria's whereabout from Deis, sister of Myria. Crossing the ocean to the forgotten northern continent, the group finds a town littered with advanced technology from a forgotten age, and then proceed to the last known village of the Brood, Dragnier, where they learn of the battle between the heroes from the first Breath of Fire and the Goddess millennia ago, and how she has returned to seek her revenge against the Brood. Crossing a large desert, the team arrives at the ruined city of Caer Xhan, a former haven of technology, with a lift leading to Myria's fortress. Making their way up the large escalator to the floating Myria Station, the group fights their way into the facility's inner sanctum where they meet a lavender-haired young man who reveals himself to be Teepo. Having survived the attack by Balio and Sunder due to his latent dragon powers, he was later contacted by the Goddess, who convinced him to live in peaceful seclusion in her fortress to spare the world his destructive power. Unable to convince Ryu or his friends to do the same, he morphs into his Dragon Lord form and fights them, only to be defeated, his dying words revealing that he just wanted to be with his "family", Ryu and Rei. The determined group makes their way to Myria herself within the station's control center, where she reveals that she exterminated the dragons centuries ago for the same reason she removed the world's high technology: to keep humanity from inadvertently destroying themselves. She presents Ryu the same choice she gave Teepo, to live the rest of his life in peace within her station or be destroyed. If the player opts to comply with Myria, the game ends anticlimactically, showing Ryu in Eden, and blacking out with the text, "And so time passes... unchanging..." If the player chooses to challenge her, the spirit of the great tree Yggdrasil then channels himself through Peco and tells her she is taking her power too far, and like any parent, she must allow her children to make their own way. With that, Ryu and his friends fight and defeat her, fleeing the station as it crumbles around them. Garr reveals that his life must end with Myria's, turning to stone while Ryu and Nina look on, and Deis, now revealed to be Myria's sister, appears before Myria as the station falls apart, saying they will now leave the world in humanity's hands. Ryu, Nina, Momo, Rei, and Peco, now safely evacuated, find their way from the rubble and back into the desert for their journey home. Breath of Fire III was developed by members of Capcom's Development Studio 3, including director Makato Ikehara and producers Yoshinori Takenaka and Hironobu Takeshita. The game was the first in the series to feature three-dimensional environments, which were used in conjunction with hand-drawn character sprites designed by series artist Tatsuya Yoshikawa. Yoshikawa created multiple designs for many of the game's characters during production, with some in-game character sprites such as young Ryu and Teepo and adult Nina not matching their final promotional artwork. Before its release in Japan, Breath of Fire III was preceded by a promotional trailer that appeared on a demo disc of Resident Evil 2 that came bundled with the Japanese version of Resident Evil: Director's Cut. Capcom USA announced in August 1997 that the title would receive an English localization in North America, with the release date originally set for January 1998, which would eventually get pushed back to the following March. In Europe, the game was published through French publisher Infogrames (Instead of Capcom's main European partner Virgin Interactive) and was released in October 1998. In June 2005, Capcom announced that it would be porting Breath of Fire III to the PlayStation Portable handheld system alongside a similar port of Mega Man Legends, with both to be released the following August. The port features a new title logo graphic, and was re-programmed to make use of the handheld's native 16:9 widescreen display. An expanded version of the title's fishing minigame is also included, which can be shared with another PlayStation Portable owner using the system's GameShare function, with the Japanese release including a full-color fishing guidebook as a bonus. An English version of the port was later made available exclusively in Europe in February 2006, which contained the same translation as the original PlayStation release. On January 27, 2016, Capcom announced that Breath of Fire III would be re-released in February as a download through the PSN network for the PS Vita, PSTV, and other PSP hardware compatible devices. The release announcement applies only to the PlayStation Network's US store. The music of Breath of Fire III was composed by Yoshino Aoki and Akari Kaida, two members of Capcom's internal sound team who also provided the vocals for the title's ending song "Pure Again". While previous games in the series used more traditional orchestral compositions, the soundtrack to Breath of Fire III features a unique jazz-inspired motif that focuses on instruments such as piano and xylophone. In September 1997, Capcom released the Breath of Fire III Original Soundtrack published by First Smile Entertainment, which features 31 select songs from the game across a single disc. A complete musical selection for the game would not be made available until March 2006, when the company released the Breath of Fire Original Soundtrack Special Box boxset containing music from the first five games in the series. Capcom had originally intended to use the theme song "Machi" (街, lit. City) by rock band Sophia for an opening animation that was to be included in the game but later discarded. The song would later appear in the game's television commercial in Japan, and would be released as a single in July 1997 by Toy's Factory. 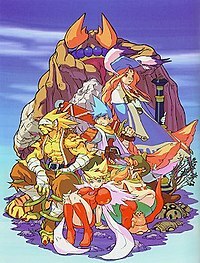 In December 1997, Capcom's released the Breath of Fire III Drama Album, a radio drama which features re-enactments of scenes from the game performed by new and returning voice actors. Some characters, such as Momo, Garr, and Peco, are re-cast, now voiced by Kotono Mitsuishi, Akio Ōtsuka, and Yukiko Matsuura respectively, while Kappei Yamaguchi now performs as both child and adult Ryu, and Kyoko Hikami returns as the voice of Nina, who also sings the album's image song, "Harmonica". The album also includes new voiced roles such as Tomohiro Nishimura as Balio, Takehito Koyasu as Sunder, and Sayaka Narita and Omi Minami as Bambi and Bimbi, a team of reporters created especially for the album. Breath of Fire III was met with a mostly positive response in Japan, with Famitsu Weekly awarding it 28 out of 40 possible points, while Dengeki PlayStation Magazine awarded it a 79% average. The game would go on to sell 425,000 copies in the region in 1997, making it the 24th most-bought game that year, as well as qualifying it for Sony's "PlayStation the Best" distinction, which allowed it to be re-released in December 2000 at a reduced price. It was also met with a positive critical reception in Europe, with Computer and Video Games awarding it a full five-star rating, concluding that it is a "totally engrossing RPG" and "highly recommended." The reception for the game's release in North America ranged from good to average, holding an average GameRankings score of 74% based on North American reviews. GamePro Magazine called it "a very enjoyable RPG in which sure craftsmanship is easily evident", giving praise to the game colorful graphics and responsive controls yet criticizing its soundtrack, remarking that it "veers widely from unmemorable electronica to hopeless schmaltz." GameSpot declared that despite taking the series into 3D gaming, it was still a very "standard" role-playing game, stating that "even with its handful of new features, Breath of Fire III breaks little new ground." IGN similarly declared that "[f]or an RPG, Breath of Fire presents nothing incredibly new, story-wise, however the way in which everything in the game is arranged and executed shows an incredible amount of attention to detail and depth," additionally giving praise to the game's "memorable characters" and "immersive" gameplay. Game Informer called it a "fairly straight-forward RPG" with colorful graphics and good characters, but found the long load times and high rate of enemy encounters to be a hindrance. PlayStation: The Official Magazine called the game a "must buy", calling attention to the game's "clever use of sound effects, detailed animation, and well-written, often humorous dialogue," adding that "to shrug this game off as 'more of the same' in the role-playing department would be a crime." The North American version would go on to sell 230,000 copies in its first year. Next Generation reviewed the PlayStation version of the game, rating it four stars out of five, and stated that "Breath of Fire III is more than matched against the new breed of visually flashy RPGs on the market." The re-release of Breath of Fire III for the PlayStation Portable was received similarly to the first in Japan, with Famitsu giving the game a marginally better score of 29 out of 40. The game would go on to sell 23,448 units in the region, enough to qualify for a re-release under Capcom's "CapKore" label at a reduced price in January 2007. European reviewers of the game were mixed. Some, like Eurogamer, were critical of the game's aged presentation and gameplay, claiming that "with nine years of intervening genre development since its inception, this is no wunderkind," citing the port's long load times and slow gameplay to be its downfall. Others, such as Play Magazine, found it to be "pretty generic, as all RPGs never fail to be, but does it all expertly, providing a great adventure that will soak up some hours." Official UK PlayStation 2 Magazine called the game "archaic yet charming" and recommended it only as a window into the genre's past. The PlayStation Portable version retains a slightly lower average score on Game Rankings at 70.9%. ^ a b Kellen (January 27, 2016). "Breath of Fire 3 (PSP) is coming to PSN this February". Capcom/Unity blog. Retrieved 29 January 2016. ^ a b "Breath of Fire 3". Electronic Gaming Monthly. No. 87. Ziff Davis. October 1996. p. 96. ^ a b c d Reyes, Francesca (1998-05-15). "IGN: Breath of Fire III Review". IGN. Retrieved 2007-10-15. ^ a b c "C h a r a c t e r s" (in Japanese). Capcom. 1997. Archived from the original on 2010-02-14. Retrieved 2010-07-06. ^ Capcom (1998). Breath of Fire III Instruction Manual. Capcom. pp. 6, 7. SLUS-00422. ^ Teepo: So who is he? / Rei: I told you-- I don't know—I found him in the woods / Teepo: Really...? Sounds like what happened with me... / Rei: An orphan... Not surprising—It's been a lean year... Breath of Fire III (English version). Capcom Co., Ltd. 1998. SLUS-0042. ^ Capcom (1998). Breath of Fire III Memorial Book (in Japanese). Koei. ISBN 4-87719-524-6. ^ a b Johnston, Chris (1997-08-22). "Ready for Breath of Fire III". GameSpot. Retrieved 2010-07-06. ^ a b c Ogasawara, Nob (February 1998). "Breath of Fire III Review". GamePro. IDG Communications (113): 116–117. ^ Gantayat, Anoop (2005-06-05). "Capcom Brings Two to PSP". IGN. Retrieved 2010-07-06. ^ Gantayat, Anoop (2005-06-17). "Breath of Fire III Update". IGN. Retrieved 2010-07-06. ^ a b "BREATH OF FIREIII / ブレス オブ ファイアIII" (in Japanese). Capcom. 2005. Archived from the original on 2010-05-23. Retrieved 2010-07-06. ^ a b c Parkin, Simon (2006-03-06). "Breath of Fire III (PSP) review". Eurogamer. Retrieved 2008-11-15. ^ a b Gann, Patrick (2000-08-27). "RPGFan Soundtrack - Breath of Fire III OST". RPGFan. Retrieved 2010-07-06. ^ Johnston, Chris (1997-07-24). "Capcom Readies RPG". GameSpot. Retrieved 2010-07-06. ^ "TFDC-28069 / City / SOPHIA - VGMDb". VGMDb. Retrieved 2010-07-06. ^ a b "FSCA-10019 / Breath of Fire III Drama Album - VGMDb". VGMDb. Retrieved 2010-07-06. ^ "Breath of Fire III". Electronic Gaming Monthly. Ziff-Davis Media (107): 112. June 1998. ^ a b "New Games Cross Review". Weekly Famitsu (in Japanese). Enterbrain, Inc. (457): 25. 1997-09-15. ^ a b c Reiner, Andrew (1998). "Breath of Fire III review". Game Informer. Gamestop Corporation. Archived from the original on March 15, 2005. ^ Mage-or Mike (May 1998). "Breath of Fire III". GamePro (116): 111. ^ a b Fielder, Joe (1998-05-14). "Breath of Fire III for PlayStation Review". GameSpot. Retrieved 2008-10-15. ^ a b "Finals". Next Generation. No. 41. Imagine Media. May 1998. p. 110. ^ a b Salmon, Jude (March 2006). "Breath of Fire III review". Play Magazine. Imagine Publishing (127): 97. ^ a b Frost, Stephen (April 1998). "Breath of Fire III review". PlayStation: The Official Magazine. Imagine Publishing (8): 25. ^ a b "Breath of Fire III Reviews". GameRankings. Retrieved 2008-10-15. ^ "Breath of Fire III review". Dengeki PlayStation Magazine (in Japanese). Tokyo, Japan (56): 122. October 1997. ^ "MagicBox Top-Selling Console Games for 1997 (Japan)". MagicBox. 2006. Retrieved 2007-02-21. ^ "MagicBox US Platinum Games chart". MagicBox. Retrieved 2007-03-09. ^ "Sony PSP Japanese Ranking". Japan-GameCharts.com. Archived from the original on 2008-10-12. Retrieved 2009-01-02. ^ "Breath of Fire III review". Official UK PlayStation 2 Magazine. Future Publishing (65): 88. March 2006. This page was last edited on 22 April 2019, at 01:46 (UTC).